Okay, so it’s my turn. Now that the dust is settling a bit, I’ve been reflecting about what’s happened over the last few weeks surrounding Dan Cathy’s statements about biblical marriage and what ultimately culminated in Chick-Fil-A Appreciation Day this past Wednesday. And while I’m not the first or last to make these observations, please take them for what they are: simply observations about what has become perhaps the most polarizing social/religious issue of the year. They are not meant to critique anyone who chose to participate or anyone who chose not to. There have been thoughtful opinions on both sides (here and here for example) and I think it’s safe to say that choosing to eat or not eat a chicken sandwich is truly (in a divine twist of humor) something that we can file under Romans 14. On “Chick-fil-A Appreciation Day": "Marching on Chick-fil-A tomorrow like an army will produce nothing more than defined battle lines"
Read more about On “Chick-fil-A Appreciation Day": "Marching on Chick-fil-A tomorrow like an army will produce nothing more than defined battle lines"
Chicago Pastor: Blocking Chick-Fil-A Is "Anti-Religious, Agenda-Driven Bullying"
Read more about Chicago Pastor: Blocking Chick-Fil-A Is "Anti-Religious, Agenda-Driven Bullying"
New York Mayor Michael Bloomberg: "This is just a bad idea and it’s not going to happen in New York City"
Read more about New York Mayor Michael Bloomberg: "This is just a bad idea and it’s not going to happen in New York City"
This is not about being “right” or “wrong” on an issue. This is about menacing and bullying people into conforming or paying the price. It’s about the bastardization of the word “tolerance” in our society, to the point where the word no longer means “live and let live” or “let people be who they are”; the word has become distorted in a very unhealthy way. 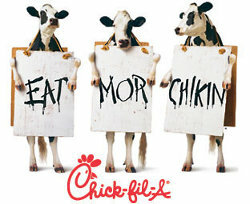 Chicago Mayor Rahm Emanuel: "Chick-fil-A’s values are not Chicago values. They’re not respectful of our residents, our neighbors and our family members. And if you’re gonna be part of the Chicago community, you should reflect Chicago values"
Read more about Chicago Mayor Rahm Emanuel: "Chick-fil-A’s values are not Chicago values. They’re not respectful of our residents, our neighbors and our family members. And if you’re gonna be part of the Chicago community, you should reflect Chicago values"